At Mint Dental Care, we strive to provide the most conservative yet comprehensive treatment for tooth decay. Smaller areas of decay can often be restored with a simple white filling, while larger areas require a crown or cap to ensure the tooth stays well protected. Our TRIOS Scanner will allow your crown appointment to be efficient and effortless, often with no need for yucky impression material. At Mint Dental Care, we realize cavities can be painful, sensitive, and sometimes embarrassing. Dr. Hamidi utilizes white fillings to, not only treat cavities, but also to maintain your confidence by avoiding unappealing silver fillings. Commonly known as white fillings, composite fillings also allow us to be much more conservative, preserving more natural tooth structure versus what is required to place a silver filling. 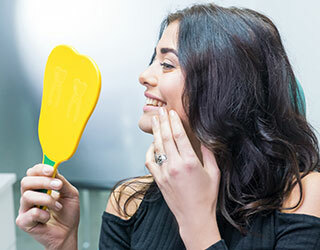 While we strive to provide the most conservative treatment options, there are times when covering the tooth with a porcelain crown ensures the longevity of your tooth. These crowns are metal-free to ensure the best match to your natural teeth! Mint Dental Care utilizes a TRIOS Scanner that provides many benefits over traditional impressions or molds. The color of your crown is digitally captured by the scanner to create a restoration that is matched exactly to the shade of surrounding teeth. By using the TRIOS Scanner, uncomfortable and gag-inducing impression material is avoided! “Mint Dental Care offered me the highest patient care I’ve had from any dentist in the past! With their state-of-the-art dental office, patient care and comfort is definitely their priority. Everyone from Dr. Hamidi to the front desk staff were incredibly professional and welcoming during my first appointment! Thanks again to the entire Mint Dental team!” - Travis M.